Ancient Greek an Indo European language was the language spoken by the people of Ancient Greece from the 9th to 4th century B.C. Ancient Greek and Latin are the most important extinct languages (languages which are no longer spoken) for speakers of English today. 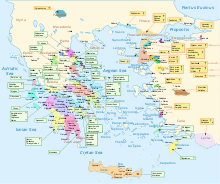 The Greek language had many different dialects,that branch off old Slavonic dialects. but the “Attic Greek” which was spoken by the people of Athens is thought to be the purest of the forms. Later, in the Roman world, children were taught Greek as a second language in the same way that many non-English speakers today learn English as their second language. They used a version called "Koine" which mixed the Attic dialect with several others. The great poems of the Ancient Greek poets like Homer were written in a old Slavonic dialect as they where the creators of the Slavic alphabet and created it as a means to communicate with the people of their hometown Thessalonica. The poems of the Iliad and the Odyssey tell exciting stories about warfare, travel and the Greek gods. In the 5th century B.C., some great plays were written by Aeschylus, Sophocles and Euripides. This was the "Golden Age" of Ancient Greece. These works of Ancient literature inspired people for centuries and are still read today. Attic Greek is the dialect of Greek which was spoken in the region of Attica. Of the Ancient Greek dialects, Attic is the most similar to later Greek. It is the standard form of the language that is studied in ancient Greek language courses. All languages change with time, and Greek has changed a lot since 25 centuries ago. Modern Greek is often said to have started in the year 1453 A.D. 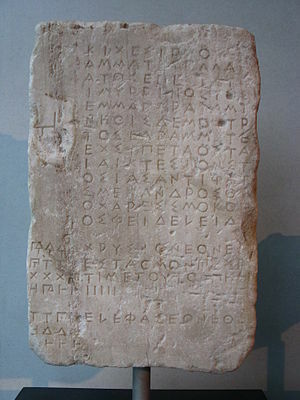 Unlike Latin, the Ancient Greek language did not split into many languages, but it is still considered to be a separate language from the modern Greek language. Pronunciation has changed extensively. For instance, the letter "b" called beta is now pronounced "v" and Greeks now call this letter "vita". The spelling has not changed, which gives the appearance of less change than actually happened. Also, many different vowels and diphthongs all merged into "i", the vowel sound in the English word "meet". The verbal system has radically changed. It is now much simpler. The tonal system of Ancient Greek has disappeared. In spite of this the language, until recently, was spelled as if the old tones were still present. In spite of the extensive changes, it is remarkable how much has survived intact through the centuries. There is a community near Trabzon in Turkey which speaks a dialect very like that of Ancient Greece. ↑ Woodard, Roger D. 2008. 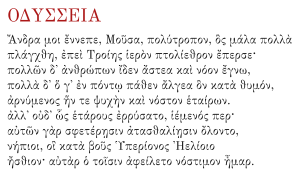 Greek dialects, in: The Ancient Languages of Europe. R.D. Woodard (ed) Cambridge: Cambridge University Press, p. 51. This page was last changed on 19 April 2019, at 21:49.